THIS CHAPTER PROVIDES THE CONTEXT FOR LIFE CYCLE APPROACHES IN CANADA AND AROUND THE WORLD. IT CLARIFIES THE PURPOSE AND STRUCTURE OF THIS REPORT AND DESCRIBES THE NATIONAL ROUND TABLE ON THE ENVIRONMENT AND THE ECONOMY’S (NRT) RESEARCH AND CONVENING PROCESS THAT LED TO THE REPORT. Life Cycle Approaches are one of the core tools that can be used to advance sustainable development. Around the world, businesses, countries and international organizations are increasingly creating policies and programs that include aspects of Life Cycle Approaches to help integrate economic and environmental dimensions in the decision-making process. The need to apply tools like Life Cycle Approaches is growing as the number and severity of environmental and socio-economic pressures mount globally. 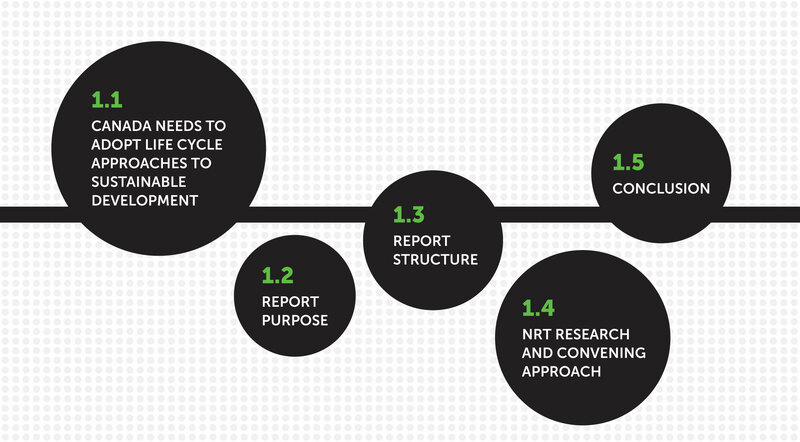 The NRT defines Life Cycle Approaches as a group of concepts, programs, tools, and data that involve identifying, understanding, and reducing inputs (economic or environmental) and their associated impacts generated throughout the entire life cycle of a product, technology, or process. Canada was a leader in conceptual and practical applications related to Life Cycle Approaches in the 1990s. At that time, the Government of Canada (GoC) promoted and provided guidance on the adoption of Life Cycle Management (LCM) in the private sector1, created a publicly accessible Life Cycle Inventory (LCI) Database (called the Canadian Raw Material Database) and contributed to the creation of International Organization for Standardization’s (ISO) Life Cycle Assessment (LCA) standards. Since this time, Canada has not actively adopted Life Cycle Approaches in a comprehensive manner and now needs to keep pace with the global trend. This lack of adoption of Life Cycle Approaches exposes Canada to economic risks, such as the inability to respond to formal regulatory demands of importing countries for life cycle-based labelling or life cyclebased product requirements. Canada is starting to encounter these risks with our largest trading partner, the United States (U.S.), and with European Union (EU) member states, in several sectors including oil and gas (e.g., fuel standards and directives), aerospace, electronics, and building and construction. Canada risks serious harm to its national economic interests by not proactively developing frameworks nor engaging in initiatives related to Life Cycle Approaches domestically and globally. Already significant are the market requirements placed on Canadian firms by other firms requiring life cycle information as a condition of doing business. Businesses around the world are increasingly using Life Cycle Approaches to respond to these requirements and other related risks. Life Cycle Approaches also offers opportunities such as cost savings through reduced resource use. Businesses that respond to these opportunities and risks related to Life Cycle Approaches have an advantage over their competitors. Businesses that use Life Cycle Approaches for economic purposes also incur related environmental benefits, thus improving the overall health of the global environment. Life Cycle Approaches are a method to target the areas of greatest impact in the development of products, processes, or technologies — known as hot spots. It allows private firms to realize more immediate economic gains and enhances future planning capabilities by foreseeing areas of long-term economic and environmental concerns. This will become even more important as two anticipated changes materialize: (1) external costs of environmental impacts are likely to become more internalized within firm-level costs, and, (2) resource scarcity is likely to drive up costs of commodities and create supply-chain disruptions. Life Cycle Approaches have the ability to support firms in their business decision making by integrating cost-effective measures from product design along the supply chain right through to waste and disposal. Several economic and environmental drivers are increasing the adoption of Life Cycle Approaches across the world. Numerous countries are facing ongoing serious economic crises and uncertainty threatening competitiveness and international trade. To remain globally competitive, private sector access to international and domestic markets is critical, as is innovation to attain a competitive advantage. Many governments are also operating in an environment of fiscal restraint, leading to increased scrutiny of spending with the goal of decreasing overall public sector spending. Decreasing regulatory burdens on firms is also a priority across many jurisdictions, and yet the importance of mitigating environmental and social risk is only increasing. Life Cycle Approaches are one of the core tools that can be used to advance sustainable development. At the same time, other major drivers of change such as increased information flows and a growing global population are presenting new operating challenges. Long and complex value chains are becoming visible and identifiable as more and more information comes online. Demand for environmental and social risk mitigation is increasing as population pressures grow and as awareness of the human health consequences of environmental pollution increases. Recent estimates predict that the world’s population will rise 30% by 2050, resulting in a global population of approximately nine billion people2. With this growth comes increasing consumption of goods and services. Most goods and services cause environmental degradation or depletion during their life cycle through raw material extraction, manufacturing, transportation, use and disposal. Pollution related to the production and consumption of goods and services is a major issue, which will increase as the world’s population continues to grow and consume. Some question whether enough natural resources exist to meet this rise in demand. There is evidence that some country’s current demand is not sustainable in terms of consumption and production — and this includes Canada. In a 2007 study of 130 nations, Canada had the seventh largest Ecological Footprint3, requiring approximately four Earth’s to sustain Canada’s consumption patterns4. The environment may not be able to endure the impact of this increased consumption of goods. Life Cycle Approaches have the ability to support firms in their business decision making by integrating cost effective measures from product design along the supply chain right through to waste and disposal. The NRT is pleased to present this report that addresses these questions and includes recommendations designed to create the conditions for progress for Life Cycle Approaches both in the Canadian private sector and within the federal government. Our report will help the GoC understand how Life Cycle Approaches could contribute to long-term sustainability in Canada, determine what role the government could play to facilitate successful implementation of Life Cycle Approaches, and recognize in what context Life Cycle Approaches could lead to short- and long-term benefits. Chapter 2 provides an overview of the concepts, programs, tools, and data and information included in Life Cycle Approaches with a framework for understanding their roles, as well as key definitions and related terminology for Life Cycle Approaches. Chapter 3 highlights the use of Life Cycle Approaches at the international and domestic levels, in both the public and private sectors, which are of most relevance to Canada. Chapter 4 explores the environmental and economic risks and opportunities related to the uptake of Life Cycle Approaches and provides a rationale for their use in the Canadian public and private sectors. Chapter 5 explores the conditions for successful adoption of Life Cycle Approaches by the private and public sectors in Canada, and identifies priority areas for government action. Chapter 6 presents recommendations for the Government of Canada to support the increased adoption of Life Cycle Approaches in the public and private sectors, which will enhance economic competitiveness and environmental stewardship. The NRT sought input on this project through a multi-stakeholder research and convening process that informed the analysis, findings, and recommended policy pathway. This process included strategic guidance from an Expert Advisory Committee, stakeholder engagement, and internal and external research. Bilateral meetings, round table sessions, workshops and individual consultations with knowledgeable stakeholders all helped inform the report. The NRT convened more than 100 experts and stakeholders over seven sessions to guide the research for this report. The experts and stakeholders were from several fields, including academia, the federal government, the private sector, and non-governmental organizations (NGOs). Stakeholders initially helped ensure that the direction of the research was relevant based on their perspective of key issues and developments related to Life Cycle Approaches within their sector. For example, bilateral meetings were held with pertinent government departments early on to ensure the NRT was aware of current government use of Life Cycle Approaches. Several round table sessions and workshops followed to further explore the use of Life Cycle Approaches within the public and private sectors and to validate the preliminary research findings. A number of convening events were then held to provide an opportunity for stakeholders to comment on our findings and to contribute to our recommendations. This included a round table with senior government officials (Assistant Deputy Ministers and Director Generals), at both the beginning and conclusion of the project. An Expert Advisory Committee provided strategic guidance for the research and convening process through in-person large-group meetings and individual discussions with the NRT. Membership in the Expert Advisory Committee was varied and represented industry, Government of Canada, NGOs, academics, and consultants with expertise related to Life Cycle Approaches. Policy options and directions were also discussed with them. A complete list of members is found in Appendix 1. The NRT commissioned external research for this project. This research explored the drivers, risks, opportunities, and challenges related to the uptake of Life Cycle Approaches in Canada. It investigated these issues in the context of the private sector and presented recommendations on how the Government of Canada could support the uptake of Life Cycle Approaches by Canadian businesses. It also explored these issues related to internal federal operations and decision-making processes and identified recommendations for Government of Canada action within key departments. Life Cycle Approaches are being incorporated by organizations, governments, and companies across the world to address current and growing global economic and environmental issues. Canada was a leader in the use of these approaches a decade and a half ago and now needs to keep pace with this growing global trend. The public and private sectors in Canada will increasingly need to adopt Life Cycle Approaches to ensure that the country is economically competitive and environmentally sustainable. Through this project, the NRT has identified clear risks to the Canadian economy if companies and governments do not consider Life Cycle Approaches as a vital sustainable development tool. In particular, trade and market access risks can already be observed. The private sector takes these very seriously. Addressing these risks should be a priority for the federal government. An enhanced uptake of Life Cycle Approaches by the private and the public sector will increase operational efficiencies, leading to cost savings and environmental gains for governments and companies. Better environmental stewardship can lead to improved economic competitiveness. [*] Sustainable Consumption and Production (SCP) is the use of services and related products, which respond to basic needs and bring a better quality of life while minimizing the use of natural resources and toxic materials as well as the emissions of waste and pollutants over the life cycle of the service or product so as not to jeopardize the needs of future generations (United Nations Environment Programme 2011). [†] The European Commission defines Resource Efficiency as “using the Earth’s natural resources in a sustainable manner” (European Commission 2012b). [‡] The OECD defines Sustainable Materials Management as “an approach to promote sustainable materials use, integrating actions targeted at reducing negative environmental impacts and preserving natural capital throughout the life-cycle of materials, taking into account economic efficiency and social equity” (Organisation for Economic Co-operation and Development ND).